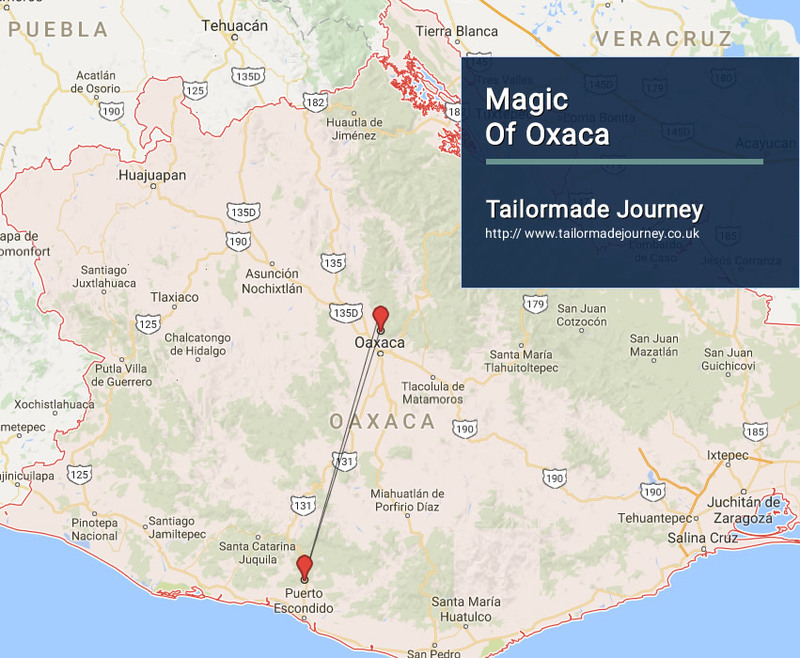 This custom Oaxaca trip takes you to the colonial city of Oaxaca, a UNESCO World Heritage Site with visits to artisan villages in the surrounding valleys and a trip high up into the remote Sierra Norte Mountains of Oaxaca. The trip ends on the Pacific Coast with an array of optional activities to complete the holiday such as hiking, deep-sea fishing, scuba diving, snorkeling, kayaking, surfing, and sailing. Arrive Oaxaca 6 Nights > Drive Puerto Escondido 2 Night >Drive Oaxaca & Leave . Overnight stay at the Hotel in Oaxaca. Today we will visit the mysterious ruins of Monte Alban and spend a few hours hiking and exploring this magnificent Zapotec site on the outskirts of Oaxaca. In the afternoon, we will have a chance to explore Oaxaca amazing city with its cobblestone streets and many churches, squares, and markets. Overnight stay at the Hotel in Oaxaca . After breakfast, visit an artisan village in the valley. You will see the homes of the craftsmen at work and learn how to weave carpets with natural plant and animal dyes. Our day will finish with a visit to the Mixtec ruins of Mitla. Today we will transfer to the pine forests of the little known Sierra Norte Mountains and the village of Benito Juarez. We will hike through the cloud forest here towards the small village of Latuvi. Our night’s accommodation is in the community owned lodge, which offers bunk beds and shared bathrooms but is very warm, clean, and accommodating. By staying here, we are contributing directly to the community and ensuring the preservation of the surrounding forest. Overnight stay at a Community Lodge. A full day of hiking awaits us today as we explore deeper into this pristine forest. Alpine lakes and rolling terrain make this a peaceful hike, and we end up at the lovely town of Llano Grande. Again, accommodation is in community owned cabins with dinner served family style in the community diner. Bunk bed accommodation with linens and hot showers. Today we’ll take in the incredible sites of surrounding nature and hike into the village of Lachatao. After lunch, we will transfer back to Oaxaca. Enjoy the evening on your own or join the group for a final night out in this fascinating city. Today we transfer by van across the mountains and down to the steamy tropical coastline crossing coffee and banana plantations en-route. After scenic drive over the mountains, we will visit a turtle research facility in the quaint town of Mazunte and check into our beautiful lodge overlooking the Pacific Ocean. Overnight stay at the Hotel in Puerto Escondido . Today is a free day to enjoy the coast. We can choose from a number of active options including rafting the Copalitariver, hiking to a beautiful remote beach for snorkeling and swimming, or walking to some fantastic waterfalls in the jungle and enjoying a refreshing swim. The evening will be spent back at our seafront lodge for sunset and a farewell dinner. Overnight stay at the Hotel in Puerto Escondido. Transferred to Puerto Escondido Airport to board flight for Oaxaca. Upon arrival in Oaxaca connect flight for onward Journey .